Don Jon only wants one thing, he wants you to want him. He needs you to need him. 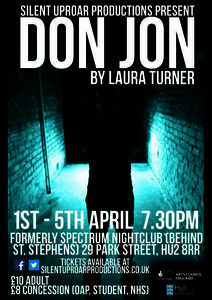 Don Jon is based on the classical legend of Don Juan, however silent uproar’s modern day appropriation devised and created with writer Laura Turner, is modernising the classical tale and throwing in the roller-coaster of the blaring lights and blood pumping sound of today’s club culture. This is a tale more than greed and lust, we want to show a story of the problems of today to speak about the issues of gender and sexuality within today's club culture. Whilst also giving the audience a feet stomping, spine tingling and tantalising night, with live bands, large scale ensemble to help create the made, physical, filthy world that Don Jon lives in. It’s going to be packed full of booze, bad choices, and nights that you wish to forget. The piece is going to explore the issues of sexual objectification and misogyny that are present within club culture enviroments. The project will take a currently unused space in Hull's city centre and transform it into a nightclub, with live band and a large community ensemble, to look like the world that Don Jon is set in. The piece will also parallel as an engagement project on two levels, the first is a series of workshops touring to local youth groups, centres, and schools, brining a version more friendly for younger audiences, due to the show's adult nature. The participants will work with the principle actors and each workshop will work towards devising a response piece to the issues from the show. Secondly we are only casting our ensemble from members of the community, working with emerging performers, due to we had response from a series of groups in the community who expressed a desire for more professional experience within devising and physical theatre that currently they feel is unavailable. Theatre needs to engage the community around it whilst also responding to it, we believe this is an issue that is rife in the area, by creating the performance but also engaging with members of younger ages we believe is the best way to speak about these social issues to the community as a whole.